On a chilly Friday afternoon at Willcocks and St. George, in place of umbrella-shaded tables and chained-down chairs, three colourful vehicles are parked next to one another. After a fairly long hiatus, Food Truck Friday returned to St. George campus a couple of weeks ago, its long-awaited return ushered in to what I can only imagine to be thunderous applause (read: loudly grumbling student stomachs). 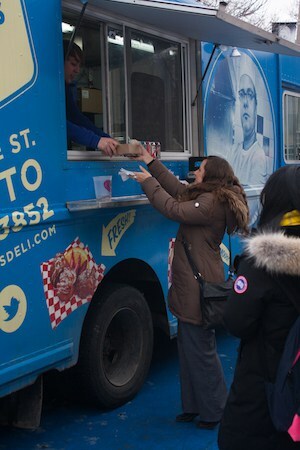 This past Friday, from 11:00 am to 2:00 pm, trucks from Caplansky’s Delicatessen, Smoke’s Poutinerie, and BeaverTails lined up on Willcocks Street, setting up shop in the heart of campus, and filling the space between Lash Miller Chemical Laboratories and Sidney Smith with edible goodness. I made my way to Willcocks and St. George after a quick stop at the ATM and, with my cash tucked firmly in the inner pocket of my coat, I was ready to take on the formidable task before me: exploiting everything Food Truck Friday had to offer, all in the name of student journalism. In my younger and more vulnerable years, I prided myself on my keen ability to ingest large amounts of food. I would devour any quantity of servings put before me. As of late, however, my stomach has seemingly shrunk, and I am no longer the gastronome I once championed myself to be. Feeling like David with his slingshot, staring at the notion of marathon food-ingestion from food trucks as a four-wheeled Goliath, I enlisted the help of my friend Eric, who would serve as proxy, eating that which I myself couldn’t. As the clock struck noon, Eric and I divvied up the trucks, approaching Food Truck Friday methodically, like soldiers closing in on an enemy bunker — if the enemy bunker happened to have a deep fryer and a napkin dispenser. Eric went off to Smoke’s as I closed in on the blue Caplansky’s truck, joining a huddle of waiting patrons. There’s always a moment of confusion when approaching a food truck, as you figure out who’s actually in line, who’s waiting for their order, who’s standing back and assessing the menu, and who’s mulling aimlessly. After establishing where the line truly commenced, I hopped in — knowing exactly what I wanted. As someone who identifies as Jewish, I have a relatively high standard for deli. Somehow, a corned beef sandwich on rye with a little toothpick sticking out of it has come to be emblazoned on my culture’s coat of arms. I was raised on the belief that not just any old deli will do, and that pulling off the perfect sandwich is an art form not easily mastered. I ordered a smoked meat sandwich and a small slaw, which cost a total of $10. As I awaited my order, other people received theirs: a BBQ brisket sandwich, and some sort of grilled cheese concoction. The food trucks proved to be popular selfie destinations: many students posed near them, thrusting their phones out in front of them and snapping a selfie or two. They treated the trucks as photo-ops, using their likeness to feed their Newsfeed rather than their stomachs. The blue hoodie-wearing, lip ring-sporting fellow working the truck called my name to signal that my order was ready, snapping me out of my existential woes regarding the nature of food truck customers. He handed me a fully loaded cardboard box, replete with a fatty smoked meat sandwich on rye, a tiny cup of slaw, and a downward-facing pickle spear. I stopped to collect a hearty handful of napkins (as little as I may eat, a whole lot of it sure winds up on my hands and face) and to squirt a dab of mustard onto the bare rye bread. My sandwich and slaw wound up living up to my expectations, and then some. Although I prefer a leaner cut of deli meat, I was nevertheless wholly satisfied by my choice. The service had been quick, I had gotten my money’s worth with the portion size, and the meal itself was as good as any deli sandwich served in a grounded delicatessen that doesn’t have an engine, steering wheel, or gas tank. I met Eric by the Willcocks doors of Lash Miller. He had ordered Pulled Pork Poutine — which, in all its alliterative glory, was a dang steal at $6. It came in a cardboard takeout box, and it was absolutely loaded with everything the name Pulled Pork Poutine both implies and expresses. We ate standing up — which, after spending 19 years sitting down to eat, was mildly akin to performing brain surgery, or comprehending quantum mechanics. As of Friday, my days of under-appreciating the value of chairs and tables are officially over. I stole a bite of Eric’s poutine, and when I went back to grab another, he shooed my hand away, which should stand testament to the item’s quality. 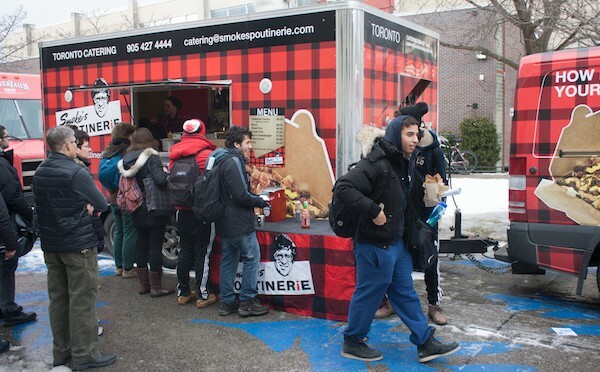 The lineup at Smoke’s was less line-shaped and more a vast, clustered mob of hungry students. Eric had beaten the after-class rush by a matter of seconds, which I could only assume made the poutine taste all the sweeter (or cheesier, or gravier, or French-fryier — the latter two are not words, but should be). Eric and I were entirely satisfied with our purchases; there was no way we could do dessert — but our mission required us to indulge in BeaverTails. I had never had a BeaverTail before Friday. For those with a similar void of pastry-based knowledge, a BeaverTail is a flat plank of fried dough, topped with various confections, like crumbled Oreo bits, Nutella, cinnamon, banana slices, and the like. My appetite already suppressed and satiated, I trekked onward (you know, for the sake of journalism), and ordered myself a Chocolate Hazelnut BeaverTail, an item which I classify romantically as sweet, sweet overkill. Eating it was somewhat of a challenge, what with my belly already quite full; nevertheless, it was delicious. Although it was a tad difficult to eat — what with its flatness and its bizarre, envelope-like packaging —the maxim, “If at first you don’t succeed, try, try again” blared in my ear, as I conquered the BeaverTail (except for a small, hazelnut-heavy corner) once and for all. Eric looked on, and when he reached for a bite, I mirrored his previous behaviour by shooing him away. The only thing sweeter than the poetic justice, of course, was the BeaverTail itself. My stomach bursting at the seams, I made my way to my tutorial in Sid Smith. Food Truck Friday had treated Eric and I well, and even though I didn’t have much time to get to class, I walked slowly, taking my time between steps so as not to rupture any vital internal organs.